Meridian Outpost is doing its part in protecting our environment. We proper recycle and disposal of used or obsolete computer hardware and consumables and we encourage everyone to go the same. To make this process easier for you, we have compiled a list of information on how to recycle your various computer consumables or old electronic devices. Brother® Toner Cartridges, Ink Cartridges & Drum Units Ship used Brother® branded toner & ink cartridges/drum units only to the address specified by the shipping label. Shipping label can be obtain postage-free at the Brother Return Program website. Canon® Toner Cartridges Ship used Canon® branded toner cartridges only to the address specified by the shipping label that may be included in the original box the cartridge come in. If no shipping return label was provided, one can be printed by logging into Canon's Cartridge Return Program website by using the account information below and printing a shipping label. Package your used inkjet cartridges in an appropriate shipping envelope or box. Ensure there is no leakage from the cartridges. Xerox® Toner Cartridges Ship used Xerox branded toner cartridges by using a postage-free label. This label can be found at www.xerox.com/gwa. Xante® Toner Cartridges Ship used Xante branded toner cartridges/drum units only using a postage-free, Merchandise Return Label. This label can be requested by calling Xante Corporation at 1-800-926-8839. Dell® Computer Product (Printer, Toner, Ink Cartridges & Equipment) Recycling To recycle Dell's branded products, please visit Dell Product Recycling Website. 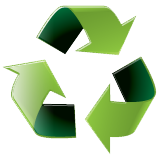 General Information on Recycling in Onondaga County, New York. General information regarding recycling for both residents and businesses. Visit www.cristina.org/epson.html for information on how you can donate your Epson hardware.